Newly-married couple Ram Charan Teja and wife Kamineni Upasana were recently spotted praying together at a temple in Tirumala. The couple, seen here with superstar Chiranjeevi, proved that a family that prays together, stays together. Upasana, Ram Charan Teja and his mother take a round of the Sri Venkateshwara temple in Tirumala. The newly-married couple offer their prayers at the temple. Happy family: (L-R) Chiranjeevi, his wife, Upasana and Ram Charan Teja. 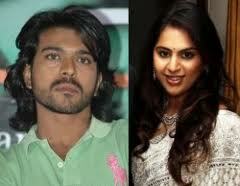 Upasana, Ram Charan tied the knot in a grand ceremony on June 14. The newly-married couple came to seek blessings at the temple. he family arrived at the temple.